A couple of weeks ago, over the period of a couple of days, I found thirty geocaches. 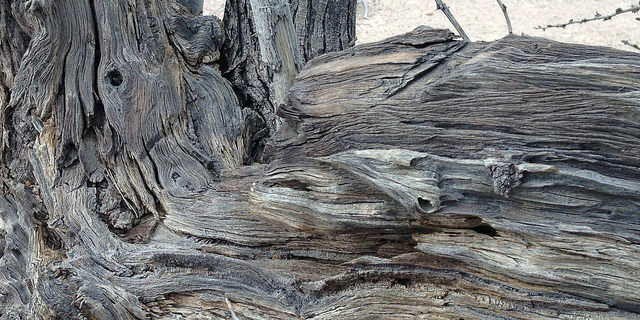 (It’s not really as spectacular as it might sound – my all-time record in one day is 84, found in New Mexico at a power trail event near Albuquerque while visiting my friend, Linda.) But I thought maybe seeing what the desert around Quartzsite, Arizona, looks like this time of year, after an unseasonable warmer couple of months than normal, would be of interest to you. And since I took a few photos while I was on my geocaching mission, here they are: kind of like a blog’s idea of the vacation photos we all bring back from Disneyland or the cruise we went on. It’s fairly green around here because of the rain we had a few weeks ago, and the rain from the clouds visible in the pics will make it even greener in the weeks to come. One doesn’t typically associate the word “green” with miles and miles of kitty litter but I can tell you, it’s green. Ish. If one were to just drive a couple miles out of town, up on a rise, and take a look around, it’s so green, it’s hard to see the tan colored sand in between the green trees and bushes that grow out here. 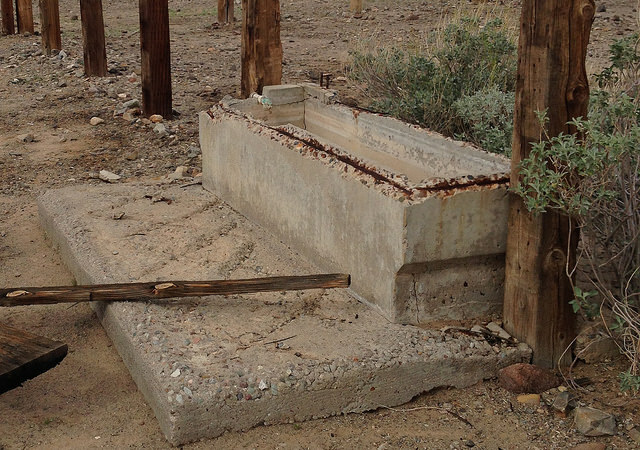 Enjoy the pics… and maybe next time, you’ll come with me to snag a few caches out in the desert! 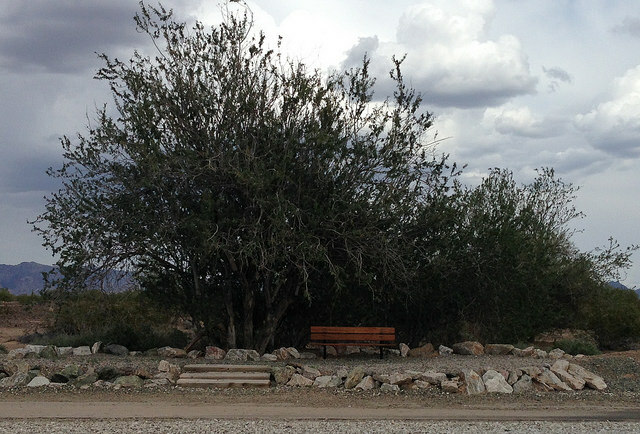 A bench in the middle of nowhere, alongside the multi-use trail. 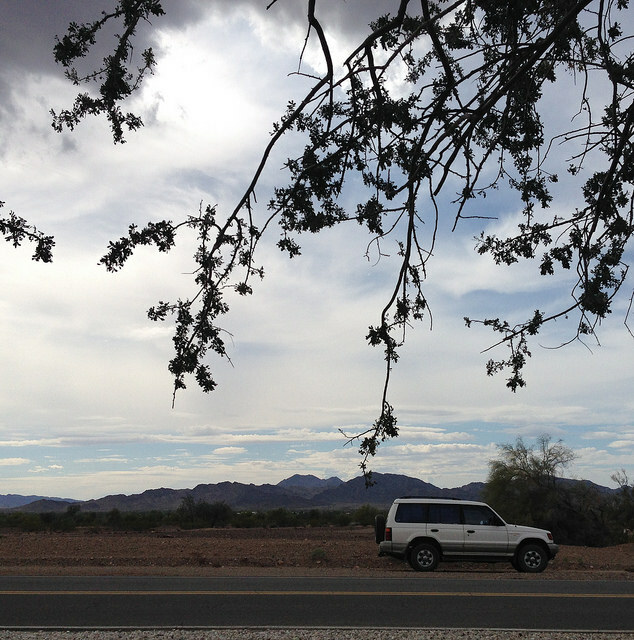 View from the bench in the middle of nowhere: the Montero looks so lonely out there. 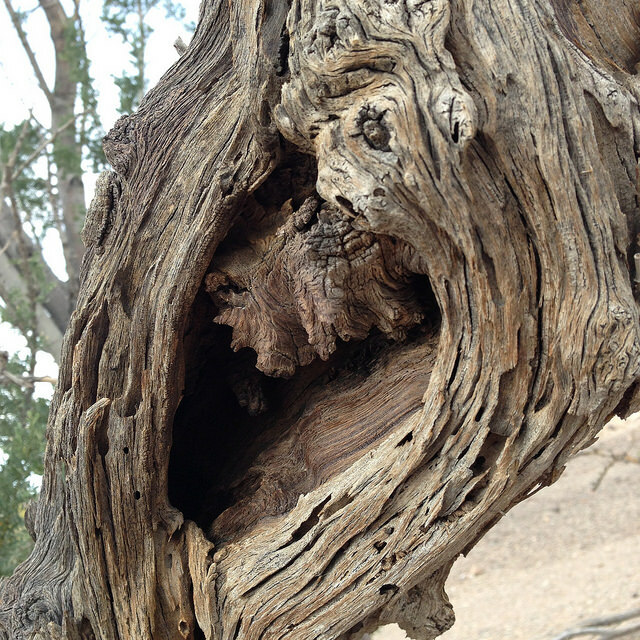 Close-up of an old tree – is there a cache in there? Nope… keep looking! Stock yard or horse corral from another time, long abandoned. Something makes these cone-shaped depressions under trees everywhere in the desert. Any ideas? Here comes the rain. Better hurry it up and get that last cache before it gets here! 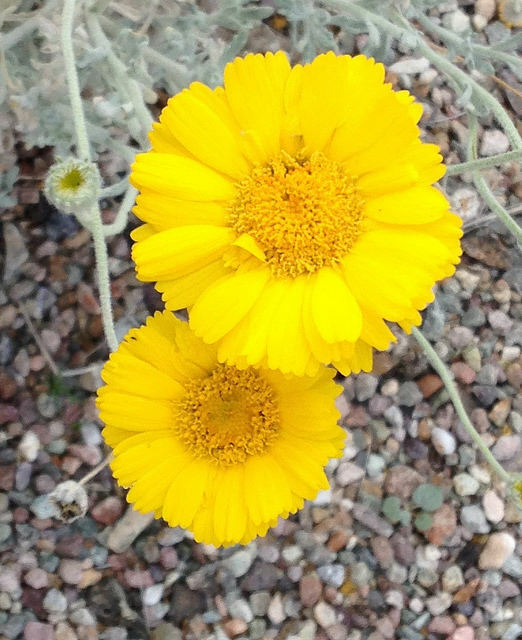 Isn’t it amazing how colorful the desert can be! 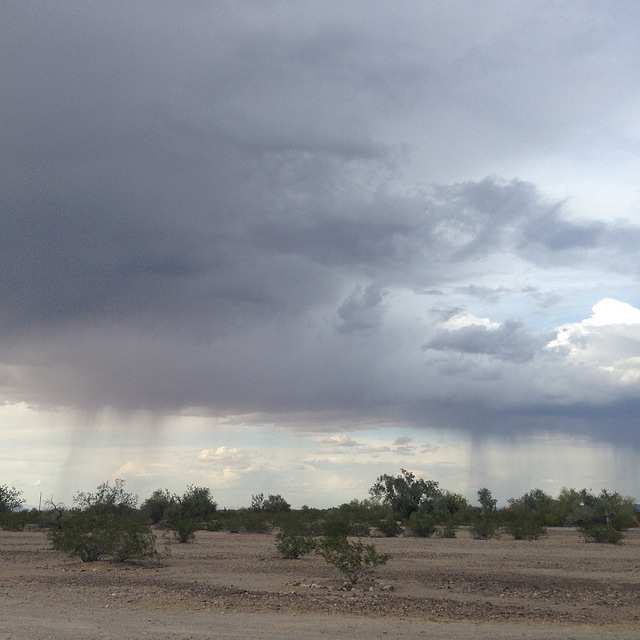 I’ve always loved it after a rainstorm. 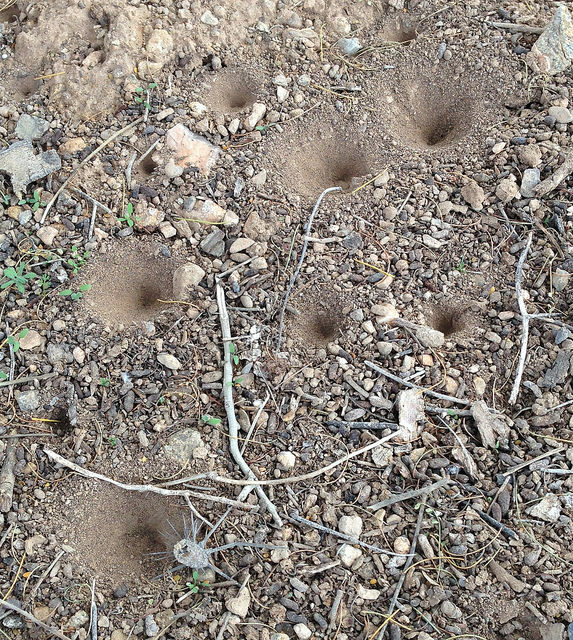 Those little burrows….hmmm…it’s not ants, I don’t think it’s scorpion…hmm, what is it? Thanks for sharing your photos. They are lovely. 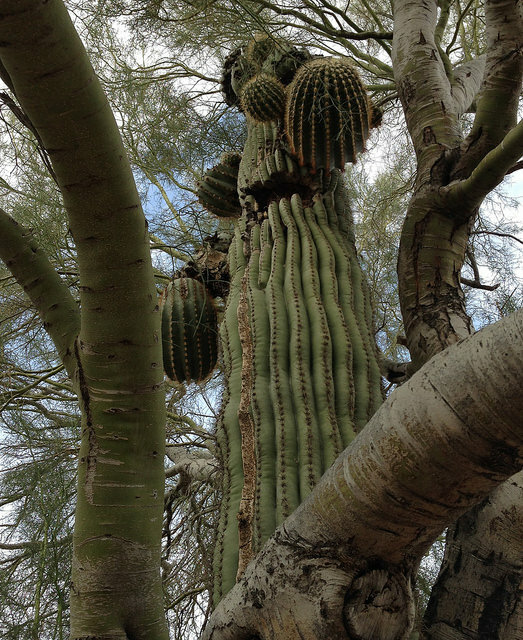 My favorite is the cactus and the tree. I hope you are currently somewhere cool and beautiful. Thanks, Blaize! 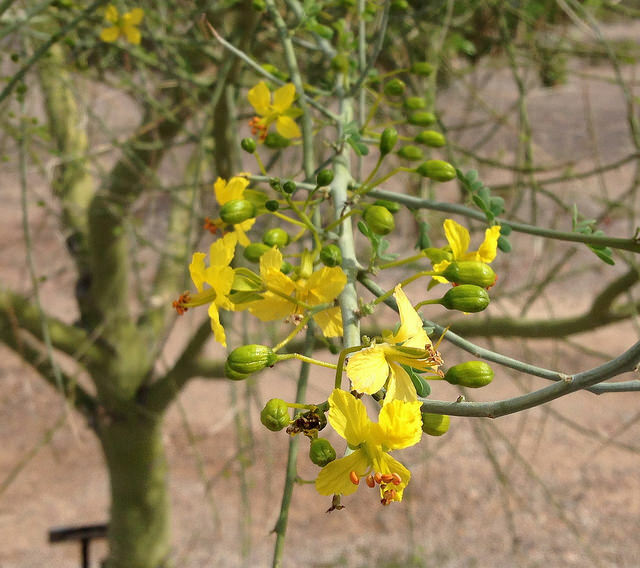 Right now, I’m near Lake Havasu in Arizona at almost a thousand feet elevation, so the days and nights are almost perfect in weather – little breeze, low to mid 80s, hardly anyone here on the BLM land, birds, bats, and lizards everywhere, desert trees taller than I am, hardly any dust. I’m loving it! Antlion– among the desert oddities. They hate trail mix, especially M&Ms–odd creatures! Interesting! These cone-shaped holes don’t have any trails to or from them so I don’t know if they’re antlion or not. Will do some further research. Thanks!!! You take the kinda pictures and tell the story that make me want a be there. …and I wish you were here, too! Thanks for stopping by and leaving a comment, Linda!